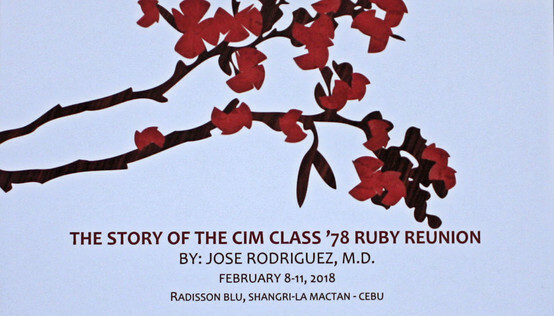 On February 8, 2018 the members of the CIM Class '78 gathered together in Cebu City to celebrate the 40th anniversary as graduates of the medical profession. Many came from faraway places and travelled long distances to commune with classmates, colleagues and friends after long years of separation. They came to celebrate a shared interest in the art of healing and of a shared humanity. They travelled to relive memories of time long forgotten and forever shelved in the unfathomable vaults of time and space. They shared stories of personal triumphs and tragedies... Of epic struggles to gain acceptance and respect in a foreign culture with deeply ingrained xenophobic biases and prejudices... Of shattered dreams and shining moments... Of unmet expectations and unexpected blessings... Of hopelessness and despair and of the ability of the human spirit to transcend and triumph against overwhelming odds and challenges. They laughed at their own foibles and of the inevitable ravages that time has wrought on their minds and bodies. They talked about their families, of their own mortality and vulnerabilities and raged against the fragility of life in an ever-changing world and of a caring profession that has become inured to pain and suffering. They voiced their concern and fears about a future that is being designed, shaped and driven by relentless advances in technology. And they ate, drank, sang, danced, hugged, talked, laughed and cried till the wee hours of the morning trying to squeeze every drop out of their precious time together and exerting a monumental collective effort to create and transform ephemeral moments into lasting and transcendent memories.......But the 40th reunion of CIM Class '78 was more than just a collection of seemingly disparate events and breath-taking moments........ It was a celebration of Life itself.